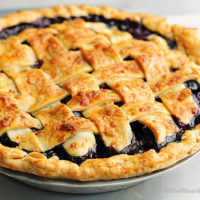 This homemade Blueberry Pie recipe is as easy as pie gets, and is the perfect summery dessert to share with company for any special occasion or gathering. Here in the South there are a few blueberry patches and farms to be found. It’s always fun to go berry picking! A few years ago, when our kids were much younger, we found a local blueberry farm. We all piled in the car, donned in our berry picking clothes one steamy Saturday morning, ready to pick as many blueberries as we could. And pick blueberries, we did. There’s this thing I have, I guess it’s kind of an obsessive compulsive behavior … if there are berries to pick, or shells to find, or lost golf balls in the woods, or hunting down the perfect Christmas tree, I can’t stop searching until all of them are found or every last one of them is at least checked out. Funny how I don’t act this way when it comes to dust bunnies floating and hopping around our home, huh? Anyway, that year we picked a bunch of blueberries, several bunches really. Many were frozen for using throughout the winter months in smoothies or oatmeal, but others were used in all kinds of goodness, from cobbler, to ice cream, to jam. But no pie. Not one single blueberry pie was made that year. 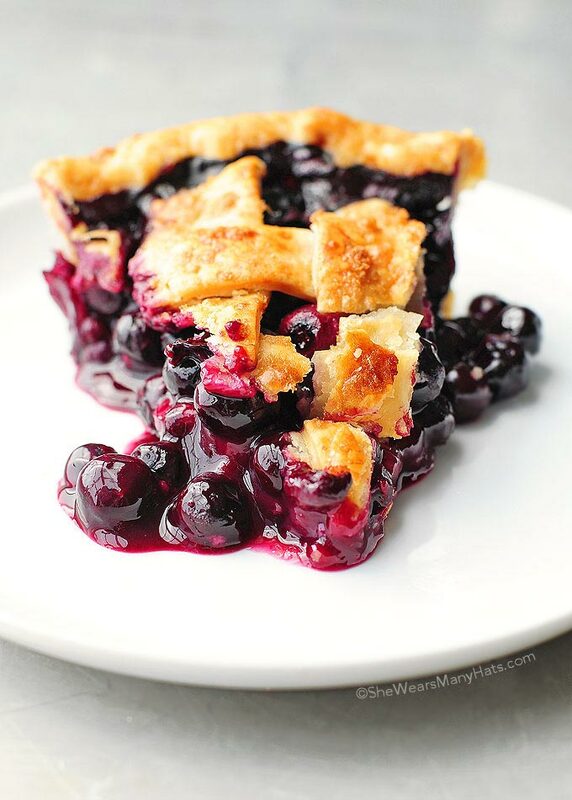 Blueberry Pie is marvelous, especially when made homemade with fresh blueberries. So I’m making up for it this year with a homemade Blueberry Pie now and maybe another one next week too, and possibly another one the week after that. Pie is so easy to make, why not make a pie per week? It’s sounds like a terrific plan to me. Terrifically terrific. 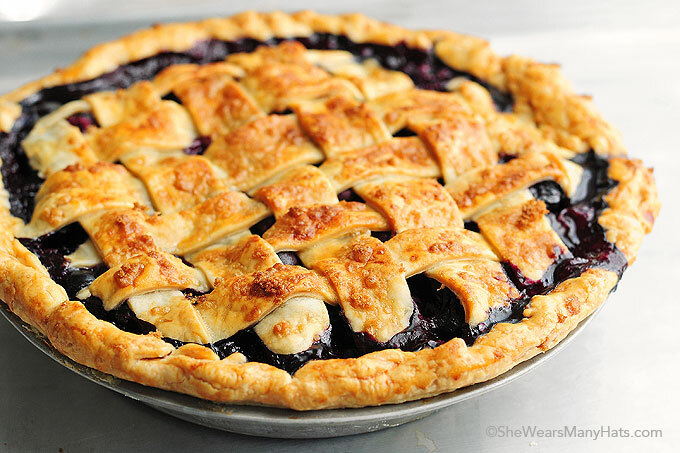 I hope you enjoy this homemade Blueberry Pie recipe. Top it will some fresh whipped cream or vanilla ice cream for an over the top dessert that just screams summer! 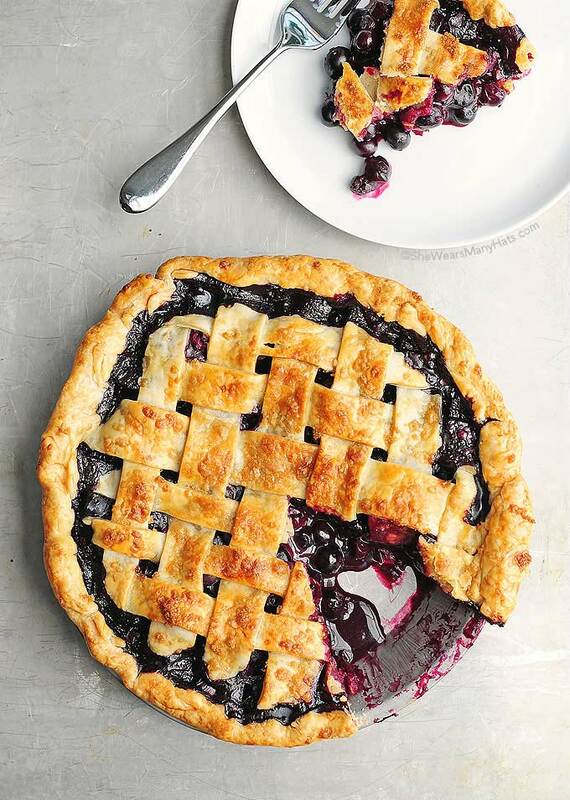 This Blueberry Pie can be frozen before baking. Assemble pie, then wrap tightly with plastic wrap, and place in a freezer zip top bag. It can be kept frozen for up to two months until ready to bake. Unwrap and thaw lightly covered with plastic wrap in refrigerator before baking. 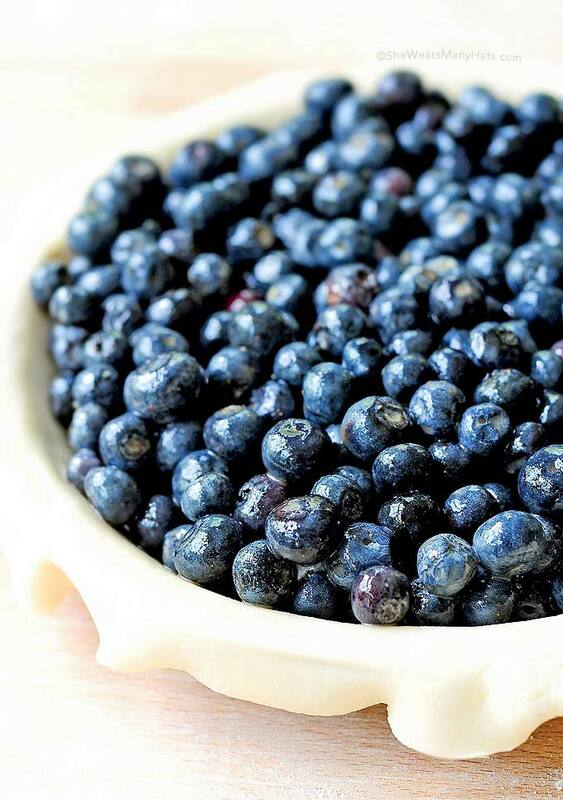 Fresh blueberries are best, but the same amount of whole, frozen blueberries could be used as well. Measure berries while they are still frozen, then allow to thaw before using in recipe. Bake pies on a baking sheet or baking stone to avoid spillage. It also makes it easier to transfer from bottom rack to top rack during baking. Baking a pie on the bottom rack at a higher temperature then lowering temperature and transferring the pie to the middle rack helps the bottom crust bake up better. I’m not a pie crust snob. Make your own, or buy pre-made pie crusts. While pie crusts is simple to make, don’t let not having time or experience keep you from making a pie. Purchase uncooked pie crusts from the grocers refrigerated section when needed. It’s better than no pie at all in my book. For the top crust, a whole crust can be used and vented, or create a simple lattice or other design with the top crust. These directions and video on how to make a lattice crust pie from Epicurious are great and easy to follow. This easy homemade dessert pie screams summer and is perfect for serving with whipped cream or vanilla ice cream. Butter a 9-inch pie pan. For crust: On a lightly floured surface, roll out half of dough to 1/8-inch-thick circle. Fit into a 9-inch buttered pie pan, trim, leaving about 1/2-3/4 inch overhang. Cover crust with plastic wrap and chill in refrigerator for about 30 minutes. If making a full top crust, roll out remaining half of dough into a circle approximately 1 inch larger in diameter than pie pan, cover with plastic wrap and chill in refrigerator for about 30 minutes. If creating a lattice top, on a lightly floured surface, roll remaining half of dough 1/8 inch thick into rectangle approximately 11x14 inches. Cut into 10 separate 3/4 inch strips. Cover strips with plastic wrap and chill for about 30 minutes. Adjust oven racks, place one rack on bottom level and one in the middle. Place baking sheet or baking stone on bottom rack. Preheat oven to 400-degrees F.
In a large bowl whisk together lemon juice and milk, gradually sprinkle in 4 tablespoons of flour, whisk until smooth. Stir in brown sugar and cinnamon. Add blueberries, and stir to coat. Let sit for about 5 minutes. Pour into prepared bottom crust. Brush crust with the egg wash, sprinkle lightly with sugar and place pie on baking sheet or baking stone on bottom rack and bake for 20 minutes. Reduce heat to 375-degrees F and transfer pie (on baking sheet) to center rack. Cover the rim of pie crust with foil. Continue to bake at 375-degrees F until crust is golden and the filling is bubbling, about 30 to 40 minutes. Check crust every 10 minutes or so, and if crust/lattice starts to brown too much, tent pie loosely with a piece of foil. 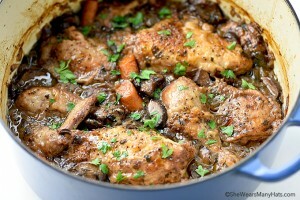 Let cool to set and thicken before serving (if you can wait that long). Originally published July 3, 2014. Blueberry pie is so flipping delicious. Love this simple version! Drool! What beautiful looking berries! I am all about easy when it comes to pies. This one is stunning, Amy! What a gorgeous pie, Amy – that first photo is drool worthy! Wow!!!! Now that’s a blueberry pie!! 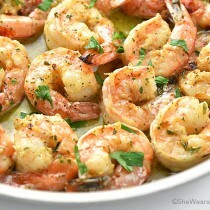 I seriously feel like I could reach right into my computer for a bite!!! 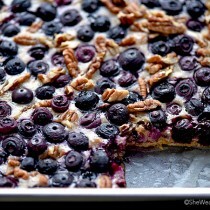 This looks like the perfect dessert for the 4th and such a great way to use up blueberries! Your pictures are absolutely gorgeous too! Beautiful pie, Amy!!! 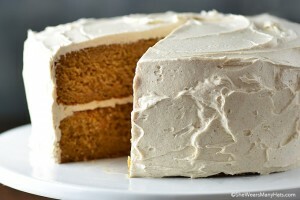 I am craving a slice (or two) of this!!! So gorgeous!! I love a good summer pie and this one looks like it would be amazing! South Georgia has become a Blueberry Heaven and hope you’ll come down to see our many farms, and berry patches! Looking forward to using your recipe! 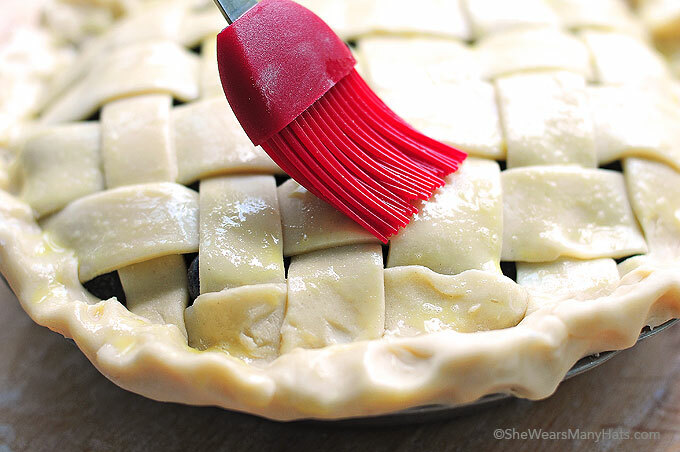 The secret to a good fruit pie is to sprinkle some sugar onto the crust before adding the fruit. It keeps the pastry flaky and helps keep the filling from being too syrupy. Thanks for inspiring me to make this for dessert this week. 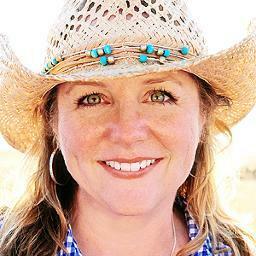 Just found your blog via foodiecrush and yours was the pie I was most drawn in by! Just wow at those pictures/the filling/the crust! Thank you so much. Nice to meet you! Amy! These photos take my breath away. You are so talented! I don’t know where in the south you live but you have it wrong about there not being many blueberry farms. We are blueberry farmers and we live in the blueberry capital of the south, Alma Georgia. In fact blueberry production has now surpassed peach production for our state. So Georgia might be known as the blueberry state instead of the peach state. That’s good to know! Thanks for sharing, Tami. More blueberry pie in my future! Thank you for the amazing recipe and steps!! It was my first pie EVER and it was a HUGE success!! Yay Jayme! Now, I need pie. Looks amazing! I want to make this! However, I’ve been reading other recipes as well and they all say you need cornstarch to help the filling set. Did you have any problems with the filling not setting properly? For this recipe a bit of flour is used as the thickener. On the blueberry pie recipe it says to bake for 20 minutes but at what temperature, then reduce heat to 375 degrees? Jan, it’s at the end of the first paragraph of instructions. 400-degrees F to begin with. I’m going to break that section up so it is easier to read. Can’t wait to make this pie. Thank you so much for the recipe Amy! I made this pie yesterday, and although it was very tasty, the bottom crust was totally raw and the middle was total soup. I followed the directions exactly. Any ideas what I can do differently next time? Celeste, I’m not sure what else to tell you other than the tip to bake on the bottom rack at a higher temperature then lower temperature and transfer pie to the middle rack. I drained almost a cup of liquid from the filling before pouring it in the shell. I used frozen berries which I thawas and drained but still, I had get rid of excess liquid. Did you use frozen? Cuz that juice will definitely keep your bottom raw and filling soupy even with the flour thickening agent. Blueberry Pie is my first time ever to make and it didn’t just turn out good but great. It taste really good. Thanks for sharing your recipe…. So glad to hear that, Mary Anne! I made this again and I used cornstarch instead of flour and cooked it ten minutes longer and it turned out perfect! So happy to hear that, Celeste. I hope it was yummy! I’m making your blueberry pie and after adding the flour to the lemon juice and cream it is a thick playdoh ball. Is that the way it’s supposed to be? It will be slightly thick but not too thick to work into blueberries. Tressa is right – this is a horrible combination. 2 tbsp of flour and there is NO way I can mix what is the equivalent of playdoh. Not nearly enough liquid for the amount of dry ingredients. Good thing I found another recipe to save the day. Good luck. Sami, not only have I made this recipe with great success, but others have too. Not sure why it turned out so horribly for you. This is my 2nd time making this pie and I am amazed with how much blueberry flavor comes through. I have made other pies that were good, but mainly sweet. This one is less sweet and more blueberry. Today’s pie is made from the last of the blueberries that I picked this summer (frozen). I think it will be the perfect Thanksgiving day dessert. Oh to have a batch of blueberries leftover from summer. How delightful, VH! I’m dying over the photos in this post. They are absolutely gorgeous! That lattice top! And the recipe looks delicious! JUST MADE THIS TONIGHT AND OMG! SO YUMMY!!! I WILL DEFINATELY HAVE TO TRY THE SUGAR ON THE BOTTOM CRUST THOUGH AS ONE SUGGESTED. THANKS FOR SHARING THIS AWESOME PIE!! My husbands favorite pie! He just peeked over my shoulder and asked if I were going to make this for him! Guess I know what I’m doing this weekend! Wonderful pie. Surprised my husband with it. Nice it wasn’t one of the overly sweet pies just good fruit flavour. So happy to hear that you enjoyed it as much as we do! I’ve Never heard of brown sugar being used in a Blueberry pie but curious about the flavor, so will try this recipe. It sounds very good. I hope you enjoy it, Sally! 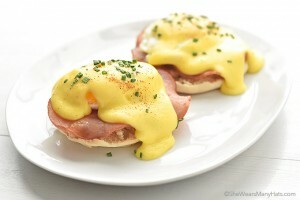 I want to jump in my screen and eat this! 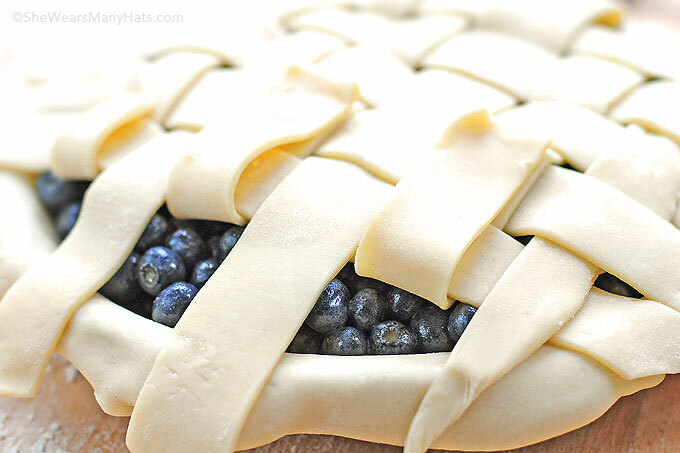 I love blueberry ANYTHING in the summer, so this pie works for me! I have been obsessed with this pie since the first time I saw it! I definitely think I’m finally going to make it for the 4th! I hope you enjoy it, Jamie! I’m sure with your excellent baking skills it will turn out amazing! I made this pie this afternoon to test it for a picnic this weekend. It is very easy and takes hardly any time to put it together. I have only one problem….is the lemon juice necessary? I can taste it in the pie and it ruins it for me.???????????? Any ideas on this, anybody? I always enjoy how lemon dances with blueberries, but you can always reduce the amount of lemon juice to your preference. My husband’s the baker in our house, and I forwarded him this link. He approved (smile) and made it for a dinner party, last night. Our guests went crazy for the pie. It’s perfect, and holds up perfectly, too, if you want to make it the day before. (Our daytime temps are triple digits, so we do our baking in the cool evening!) We served it at room temperature, with a scoop of vanilla ice-cream. Delicious. Even the “I don’t eat dessert” people were snarfling down their fair share. Thanks for sharing the recipe, it’s a keeper! Excellent to hear, Chris! Now I’m wanting a piece. I have used your recipe twice now. First time was about a week ago. That pie didn’t last 3 hours between two of us. The second is in the oven now, to be sent with my blueberry fiend to his new job away from home. He special requested it! I made a couple modifications, just more to his taste than anything else. I used just a touch more milk, maybe a tablespoon. It seems to coat the berries more easily and thoroughly than with less, and the filling comes out much richer. Second, I used a pomegranate juice powder, about 3 tbsp, as extra flavor and to kick up the antioxidant value of the pie. It makes for a rich blueberry pie with just a hint of added flavor. I’ve bookmarked your website, I will definitely be trying more of your recipes soon (if he will ever let me do anything but blueberry!!). 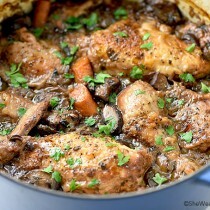 Thank you for an amazing, easy, and delicious recipe!!! Looks delish, thank you! What size pie dish, deep or regular? I apologize for the delayed reply. You may need to adjust cook time. Frozen blueberries will need to be thawed and drained. 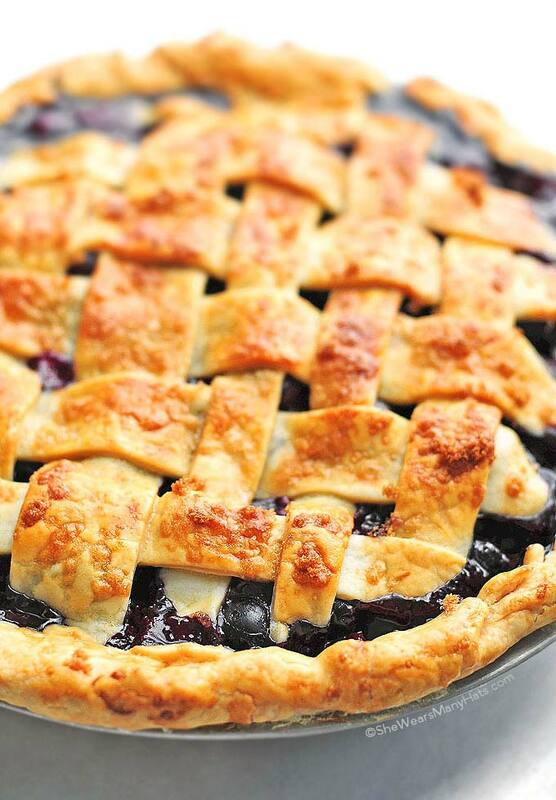 This is my go to blueberry pie recipe. It never lasts more than three days in the house. Everyone LOVES IT! Pie for breakfast lunch and dessert all day everyday! Thank you! Why does the lemon juice and flour make chunks of dough? I ended up tossing a lot of it. Amy, have you very tried same recipe ingredients w/blackberries?? Not yet, Lori. Let me know if you do!